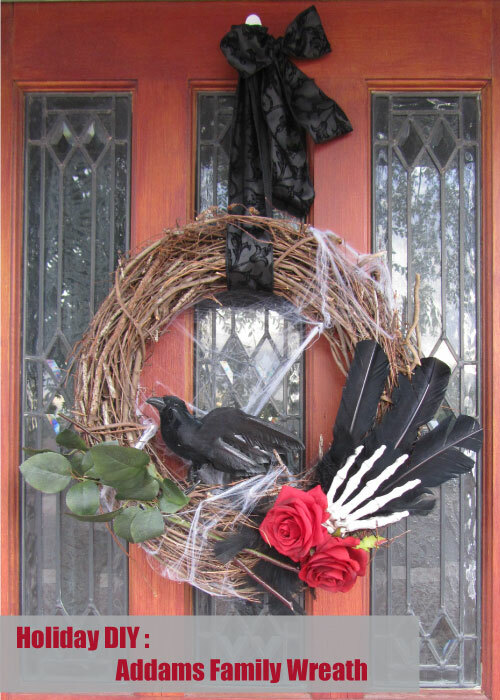 It’s almost Halloween, but there is still time to dress up your door and add a little more of a spooky element to your entryway. 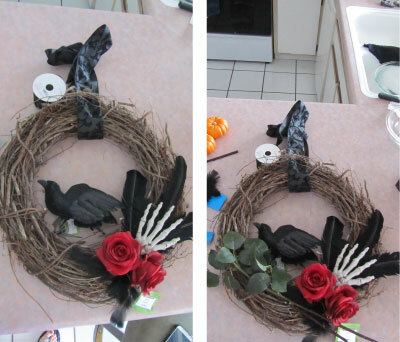 Today we wanted to share with you the wreath we made for our door, inspired by the Addams Family. It was a simple DIY project that can be completed in an afternoon. A hand – We wanted Thing to be on the wreath. We experimented with several different hands before settling on the skeleton of Thing that we used. Ribbon – we chose a patterned wired ribbon that reminded us of those fantastic smoking jackets that Gomez wears. And of course anything to keep it all together, we used twine and a glue gun, floral wire would work well too and a pair of scissors. Start by determining where you want your wreath to hang and make sure to cut the ribbon the right amount. Leave enough at the end for a bow or however you decide to finish it. We did a small bow to hide the hook the wreath is hanging on. 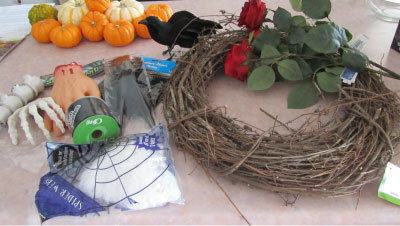 Next you will want to lay out all of the supplies and just start playing with where to place everything on the wreath. This is pretty much trial and error and your own preference. After we liked where everything was laying on ours we snapped a picture so we wouldn’t forget how it looked. 3. Once you are satisfied (and have a picture!) take it all off and start to glue everything down working in layers depending on how you arranged your items. For us we began with placing our large feathers, then the smaller feathers. Once those were secure we tied the hand on and then glued that on top of the feathers. 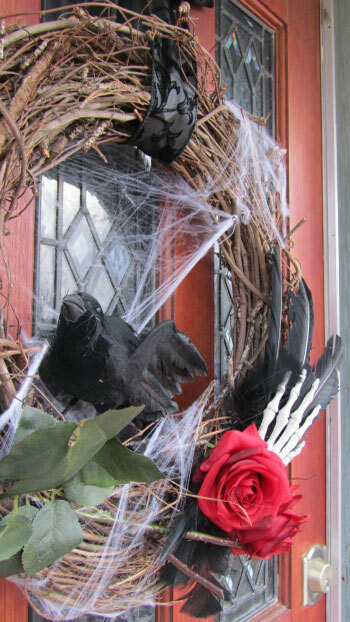 Once that was dry we added our roses, and then moved to the rose stems and the raven. Let it all dry really, really well before hanging the wreath on the door. 4. Once you are ready to hang it on the door that is when to add the spider web. Hang the wreath and then start adding the web until it is to your liking. Once you are finished take a step back and admire your work! If making this wreath was so much fun that you would like to make another, check out our Christmas wreath DIY from last year.